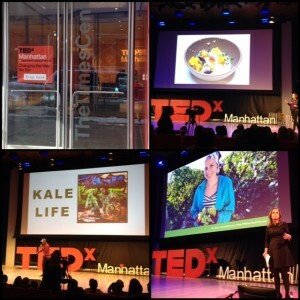 I could feel the energy in the room at the New York Times building right when I walked into TEDxManhattan: “Changing the Way We Eat”. Conversations about food buzzed around me. Everyone I met cared deeply about food and the way that it impacts people and the planet. By the time the event was over, I was overwhelmed with the excitement that our world is at a tipping point and that it’s not only food justice–the belief that everyone should have access to healthy and affordable food–but also social justice that’s at stake. If you eat, you have a say in the way our social systems are run. Food justice and social justice are two sides of the same coin. Consider exercising democracy and take action by choosing what products you support and letting your voice be heard in Washington, D.C. Factory Farming: Since factory farming is so prevalent, it must mean that it’s cheaper and more efficient, right? Actually, no. Regardless of where you stand on eating meat, factory farms are hurting the land, water, and people in the communities that live near them. Women who live near industrial farms are ⅔ as likely to have children born with autism as a result of heavy pesticide use and other airborne chemicals. Animal excrement is so bad that residents in a town near a chicken factory farm couldn’t open their windows not only because of the smell, but also all the flies that swarmed the community. “I quit my job at the EPA because I couldn’t do my job. Now I sue them. Even a loss in court can catalyze change.” said Michele Merkel of Food and Water Watch. Use your edible education to share more responsible eating habits with family and friends. When you dine out, ask if anything is local. Just keep asking. Rethink ugly. Fruits and vegetables that don’t look like model specimens still taste good. France ran a brilliant campaign about the beauty of ugly produce. Farmstand App — over 8,700 of the world’s farmers’ markets right at your fingertips. Find a market closest to you and share photos with the Farmstand community. Food Policy Action — hold legislators accountable on votes that have an effect on food and farming. Food Tank –spotlights environmentally, socially, and economically sustainable ways of alleviating hunger, obesity, and poverty and create networks of people, organizations, and content to push for food system change. Food and Water Watch — a nonprofit that champions healthy food and clean water for all by standing up to corporations that put their bottom lines before the needs of the people. Sustainable Table — your edible education starts here with invaluable articles about sustainable food and agriculture. Milk Not Jails — a volunteer-run, grassroots campaign working on building a new urban-rural alliance in New York state by ending the dependency on the prison economy and revitalizing agriculture. Socially Responsible Agricultural Project — a one-stop toolbox for concerned individuals organizing against factory farms and other industrialized agriculture. Tree of 40 Fruits — exactly what it sounds like: hybridized fruit trees developed through grafting that grow over 40 types of stone fruit. They preserve heirloom stone fruit varieties that aren’t commercially produced or available. Real Food Films — a center for collaborative media projects aimed at spreading stories of sustainable food and farming around the country. Center for Science in Public Interest — an independent organization focused on sound science in order to counter Big Food’s influence on public opinion and public policies; CSPI advocates for nutrition and health, food safety, and alcohol policy. Seeing and meeting so many like-minded people who are trying to better our food system gives me hope for our future. We are collectively healing people in our community and the environment. I’m excited about the ways we’ll continue to work together to change the way we eat.